Audi lovers come in all shapes and sizes. Whether you’re shopping for a gift for your significant other, your boss, or your car-loving toddler, the Audi Collection has some awesome items, and Bernardi Parts offers the best price you’ll find online. Then, there are the hipsters. Audi isn’t like some other premium German car makers. It’s history and DNA is drawn from the rough-and-tumble world of rally racing, and our hipster Audi friends revel in the idea of a precision driving machine that operates best caked in mud. And, of course, Audi’s unparalleled reputation for safety, including a 5-star Safety Rating from the National Highway Traffic Safety Administration has led to the A4 and other models becoming immensely popular with young families in recent years. And to an Audi driver, a toddler is just an Audi fan in the making, and Bernardi Parts has the perfect gift to instill that same passion for a great ride that mom and dad clearly already share. 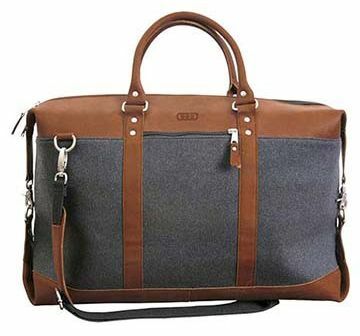 The Sawyer Wool Duffel is tasteful and stylish. Whether it’ll be used to tote gym clothes to and from the office or for a weekend getaway, the 21” W x 14” H x 8” D main pocket offers plenty of room, and flexibility comes in the form of two small zippered pockets that are perfect for personal items. Easy to carry, with riveted handles or an extendable (up to 56”) shoulder strap, and made with an eye toward durability, the duffel is made from a charcoal gray wool/polyester blend with genuine leather accents and debossed Audi rings that bring Audi’s stylish elegance to any trip. Finding the right laptop bag can be difficult. Some people swear by messenger-style bags (and the Audi Collection has these folks covered, too! ), while others prefer the hands-free convenience of a backpack. 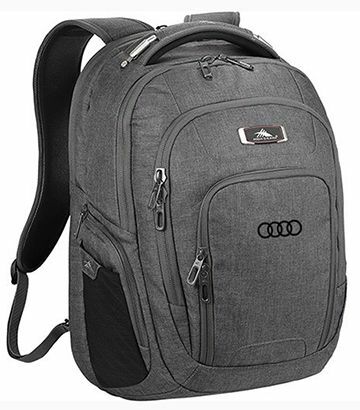 If the Audi fan in your life fits that description, then they would struggle to find a better choice than the High Sierra Deluxe Computer Backpack. With a padded, quilted 17” laptop compartment, the handsome charcoal gray pack can easily carry most laptops. The convenience doesn’t stop there. The main zippered compartment has a tablet sleeve and zippered mesh pockets to make sure things stay organized; the second compartment provides additional zippered pockets and gives easy access to whatever tech accessories and essentials you might need to tote around. With a mesh and padded back panel, there’s plenty of airflow, so you won’t show up at your meeting with the sweaty lower back of a marathoner, and the padded and adjustable shoulder and chest straps mean this pack could stand up to anything from a daily commute to the office to a weekend road trip with ease. Nobody wants to be the person who shows up to an important meeting and spends the first 5 minutes fumbling through their briefcase in search of a pen. 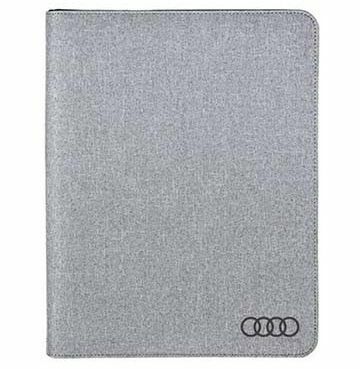 The Audi Powerbank Padfolio is one of our most popular items because it is both attractive and useful. The built-in 5,000 mAh powerbank makes it perfect for the mobile-device dependent among us, and the dedicated tablet sleeve and smartphone pocket means all of your devices are charged and ready to go when it’s time to send that all-important email. With additional pockets for business cards, charging cords, and a 60-page lined pad for the analog note-takers out there, the linen covered, full-zip portfolio will catch eyes around the table at your next meeting. A cool watch can be the perfect accessory. 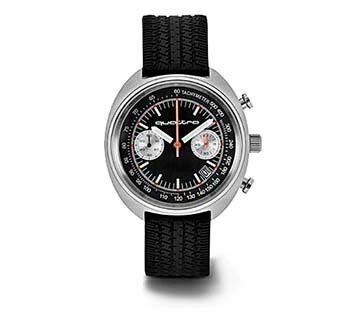 The Audi Sport Carbon Chronograph watch is the epitome of cool. The stainless-steel housing catches the eye, and the red chronograph pin is the perfect accent. 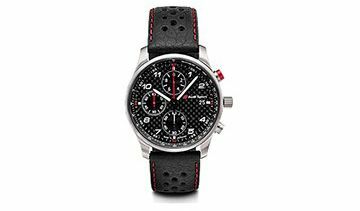 Backlit minute and hour hands provide a dramatic flair on the watch face, while the red stitching on the perforated leather strap echoes the race-inspired looks of the award-winning Audi R8. Much like the R8, the Sport Carbon Chronograph isn’t just flashy looks—it has the goods where it counts, too. With Japanese Citizen 6 S10 quartz movement, scratch-resistant K1 safety glass (the same kind used in watches provided to the US Navy Seals), and waterproof up to 10 atmospheres, this bad boy will take more than a licking, and keep on ticking! Enjoying a day on the links is dependent on having the right gear. The Audi Victory Cart Bag is always ready to play. Most golf bags will have plenty of storage options, but the Victory Cart Bag overdelivers as only an Audi-engineered product can—it has everything from a fleece-lined valuables pouch (say, for your Audi Sport Carbon Chronograph…) to a cooler pocket to keep you refreshed and hydrated for a full 18 holes, not to mention 5 zippered pockets for anything from tees to balls to greens markers. 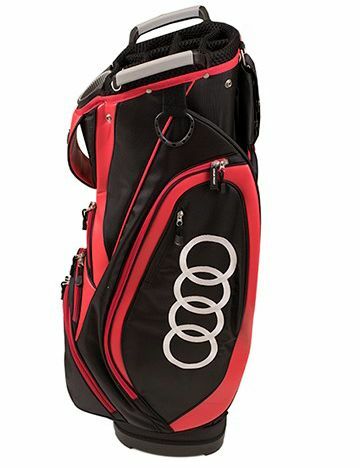 The padded strap makes for comfortable carrying to and from the clubhouse, and the embroidered Audi rings make it clear where your loyalties lay out in the parking lot. And, for those who ascribe to the old adage that golf is a good walk, spoiled, we can recommend the Audi Fairway Stand Bag, with a lightweight design that will make walking a full 18 a breeze. Nothing puts a damper on a great day on the greens quicker than a passing rain shower. 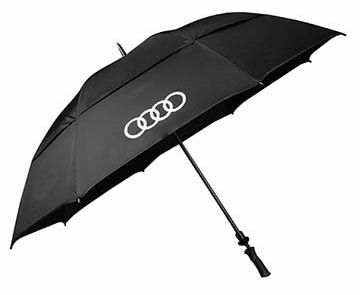 With a 64” arc, the Audi Golf Umbrella will keep you (and, depending on how close you want to get, the rest of your foursome) dry while you wait out the downpour. The automatic open button and engineered vents make for great durability on windy days, and the rubberized handle means you’ll never lose your grip…on the umbrella, anyway. Whatever you’re doing with that 9-iron is on you. Exclusive to the Audi Collection! The Heritage Canvas Art Set is a great statement piece for any room. 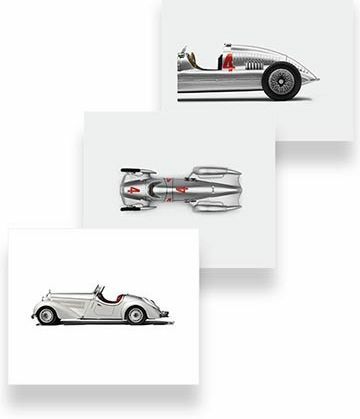 Drawing on and featuring cars from Audi’s illustrious history as perhaps the most successful builder of race cars, with 13 Le Mans winning cars in the 15 years, the Canvas Art Set includes three prints. Each print is 16” x 20”, and the set includes hanging hardware for all three pieces. This is the perfect way for the bling-allergic Audi lover to show their pride in the four rings. Racing may be in Audi’s blood, but rally driving is in every Audi’s DNA. 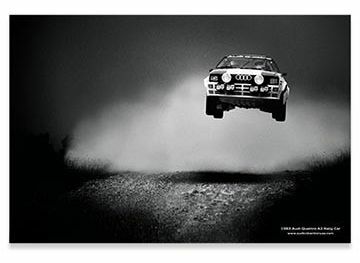 This poster captures the iconic 1983 quattro Rally Car—the car that began a legacy—and is sure to be a conversation starter in whatever room it is displayed. Your newest and soon-to-be favorite accent piece, the poster measures 16” x 20” and arrives unframed. 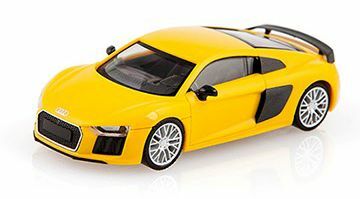 The R8 Coupe 1:87 Scale Model delivers Audi’s dynamic sportiness in miniature perfection. The 2015 R8 V10 plus Coupé is rendered in perfect detail, with the eye-catching Vegas Yellow finish making it the perfect collectible for a budding Audi aficionado. Grab some friends and relax by playing an old favorite, or learn a new game on your next road trip. 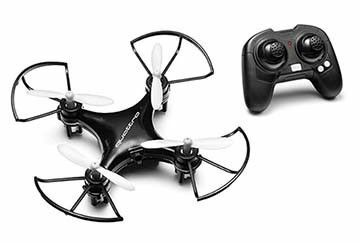 Keep in mind, state and local restrictions may apply when flying your drone. The Audi quattro Copter is recommended for children ages 13+. It’s never too early to get used to life in the pits. 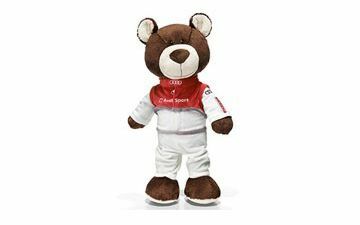 The 15 ¾” Audi Sport Motorsport Bear is the perfect cuddly companion for the Audi lover in your life, whatever their age (although we recognize it’s probably most appropriate for children over the age of 3 because of small parts that could pose a choking hazard). The bear comes dressed in a replica of the original Audi Sport racing suit, complete with Audi rings and Audi Sport logo. The zippered racing suit can be completely removed for machine washing. If you’re already giving your little Audi lover a friend dressed for a day in the pits, it’s only a matter of time until they agitate for their turn to take a lap around the course. The Audi junior quattro Motorsport will deliver a whole new understanding of Big Wheels, with a racetrack feel and a sporty black and red race-inspired look. The functioning LED daytime running lights can be turned on and off, and the black rims and Audi racing decals will ensure you have an Audi lover for life. 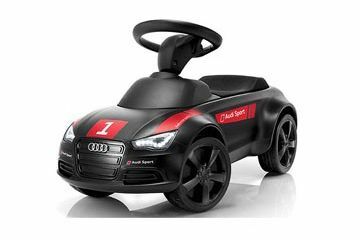 The Audi Sport Mini quattro is recommended for children ages 1-3. A road trip should be fun, and not a reason to have to stop at the nearest gas station for a cold drink. 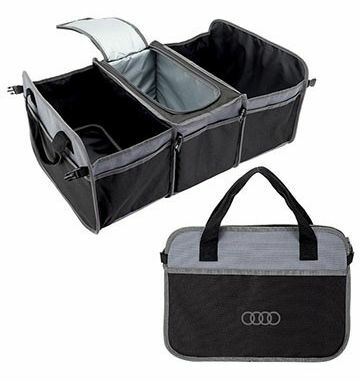 The Audi Trunk Organizer with Cooler is the perfect accessory for drives of any distance, and it means you’ll always be ready to hit the road. 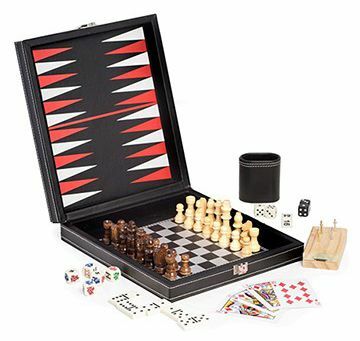 The organizer includes 3 large, collapsible compartments and 5 side pockets, as well as a stiffened bottom and carry handles for a super-convenient picnic when you get to your destination. The PEVA-lined cooler with zippered top can hold 34 12-ounce cans—plenty of room for just about anything shy of a full Thanksgiving dinner! 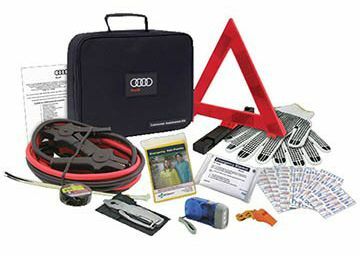 Shop the Entire Audi Collection! Not inspired by any of the awesome gifts highlighted above? 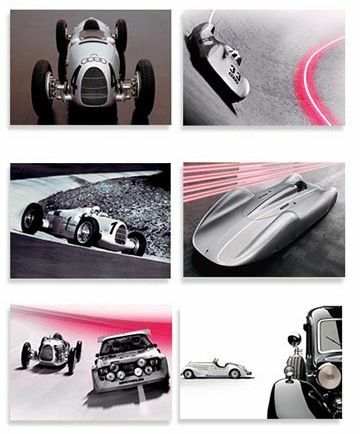 You can shop the entire Audi collection here! 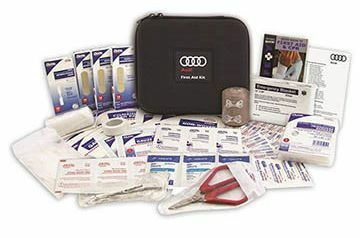 And remember—Bernardi Parts offers the best prices online for all Audi OEM parts and accessories.